Fame came quickly and at a young age for Auden. Upon arriving at Oxford, he insisted, when asked what future profession he intended to assume, that he would be a poet. His tutors were incredulous but intrigued. If anyone could achieve such a thing, it would be this self-assured young man. By his second year at Christ Church College, he was at the heart of a burgeoning group of young poets and intellectuals, who sought his opinion on a variety of subjects. Though he graduated with low marks, he had already distinguished himself as a poet, self-publishing his first chapbook while at university and placing his first book, Poems, with Faber and Faber at age 21. A few years later, King George VI presented him with the Gold Medal for Poetry. After some time spent investigating the homosexual café world of Berlin with Isherwood, he found himself, by his mid-twenties, considered the most important poet of his generation. Later in life, he would return to Oxford to take up the post of Professor of Poetry and hold his daily informal salon at a café in the Covered Market, at the center of Oxford. Much later in life, having grown somewhat disenchanted with his annual routine of a half-year in lower Manhattan interpolated by seasons in either Italy or Austria, he returned to Christ Church to take up residence in meager accommodations on the college grounds. Sadly, he found himself isolated by fame and largely ignored by students more keen to meet an authentic beatnik than the grizzled old poet. Today, undergraduates slurp cucumber soup and swap jokes in the echoing Christ Church dining hall beneath his admonishing portrait, which always seems to be hung at a slight angle, as if slouching. As with such giants as Henri Matisse and Ludwig von Beethoven, it is customary to divide W. H. Auden’s career into two distinct phases, bisected, in his case, by the Second World War. The earlier poetry, particularly that of the thirties, is defined by a preoccupation with political and historical matters, while that of the forties, fifties, and particularly the sixties, is concerned with more modest affairs such as friendship and the household. Needless to say, this split, however accurate it may seem from a distance, is a preconceived notion, which his readers would do well to dispense with entirely. There is, however, a clear shift in mid-career from peripatetic European to convivial New Yorker, when he took up residence in various apartments in Brooklyn (with Paul Bowles, Thomas Mann’s son, and uber-stripper Gypsy Rose Lee and friends, the subject of February House by Judith Moore) and the West Village (where he shared an apartment with the younger American poet, his life mate, Chester Kallman). Around this time he also became an American citizen and embraced conservative Christianity, despite his homosexuality, which was open in his circles but hardly advertised publicly as was Allen Ginsberg’s (a young composer once remarked at a dinner that Auden “doesn’t love God. He’s just attracted to him”). A devoted formalist, it can be said that the rigorous technical consistency of his poetry mirrors its moral depth, a type of well-wrought urn, though hardly the reflexive sort envisioned by the famous critic Cleanth Brooks (who had John Donne and his fellow Metaphysicals in mind). One is surprised by the dramatist’s flair and composure of Auden’s early recordings. From “The Wanderer” in 1930 on to “In Time of War” in 1938, his voice is congenial and already avuncular in spite of his youth. Unfortunately, the cigarettes caught up with him, and his once agreeable voice went gravelly. Heavy smoking and daily drinking took their toll, and from the scarcely intelligible (which is to say poorly preserved) recording of “In Memory of W. B. Yeats” onward, his voice becomes harder to take. By the midpoint of “Friday’s Child,” recorded in 1958, he sounds as though he’s just climbed up to a fifth-floor walkup. Auden coined the term Age of Anxiety (securing the Pulitzer Prize for the book of that title in 1947), and has been described as the first English poet to feel at home in the twentieth century. The most prominent quality of his work is compassion, his belief in a world where “one could weep because another wept,” his vision of “Agape,” or universalistic uncorrupted love. Attempts to peg a program or project to his career are ill fated; like any great thinker, he evolved. Unlike Geoffrey Hill (considered in some circles the finest living English poet), who never retracts a sentiment or line of poetry, Auden turned his back on much of his own writing. The most enduring and popular line from “September 1st, 1939”-the day Hitler’s panzers jumped the border into Poland, effectively sparking the Second World War, also a poem that has gained great currency in the US since 9/11, when newspapers and websites began reproducing the poem-“We must love one another or die,” was thought unsuitable by Auden because, strictly speaking, it is not true. We may love all we like, but we will still die, though perhaps not so soon or in so ghastly a manner. The poem was perfectly timed, in an historical sense, on the eve of the most destructive war in history, but, as Auden later lamented, not a word of poetry could have prevented the horrors of the Second World War. Of course, great poetry is often at once true and a bit of a reassuring fib. He changed the line to “we must love one another and die.” He then realized how unlovely the line had become once relieved of its original rhetorical clout, so he eliminated it altogether. It was only much later, when assembling a Selected Poems, that he was persuaded by friends to restore the line. Auden’s utopian meditations were formed in the shadow of the looming figures of Karl Marx and Sigmund Freud, but he eventually dismissed the political effectiveness of poetry. It is interesting that this is, in a sense, a reversal of Theodor Adorno’s insistence that after Auschwitz there can be no lyric poetry, by which he meant that no poem could exist in an entirely personal casing but must partake of the sweep and pull of history. 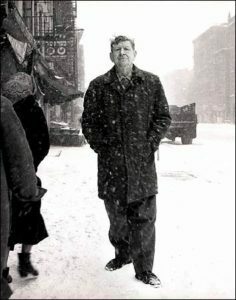 Whatever can be said of Auden today-his early, naïve ideological entanglements, his tendency to repeat himself to interviewers in his later days, his slovenly lifestyle-he must be remembered for two things: first, his compelling commitment to friendship and its attendant compassion, which was extended to universal dimensions in his poetry; and second, his dedication to the life of a poet, as man of letters, editor, librettist, teacher, critic, as manifested in his tireless involvement in forging and sustaining the cultural landscape of England and America. For these things, we remain indebted, and these recordings are nothing less than indispensable to an understanding of the man and his works.